Joaquim Mullol studied Medicine in the University of Barcelona where he obtained his medical degree (MD, 1982) and the doctorate (PhD, 1991). After completing the residency on Otorhinolaryngology (1984-88) in Barcelona, he carried out a Research Fellowship (1989-91) in the Allergic Disease Section and Asthma Center (LCI, NIAID) and Critical Care Medicine Department (CC), at the National Institutes of Health (Bethesda, USA). 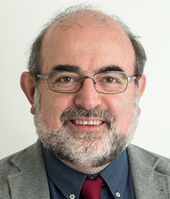 Currently, Joaquim Mullol is Professor of Research at the Universitat de Barcelona, Director of the Rhinology Unit & Smell Clinic at the ENT Department of Hospital Clínic, and Head of the Laboratory of Clinical and Experimental Respiratory Immunoallergy at the Institut d’Investigacions Biomèdiques August Pi i Sunyer (IDIBAPS) in Barcelona, Catalonia, Spain. He has served as Secretary (2001-05) and Chairman (2005-07) of the ENT Section and member of the EAACI Executive Committee (2005-07). Currently, Dr Mullol is co-chair of the EPOS guidelines and member of the Executive Committees of ARIA, ARIAenespañol, and ECARF. Dr Mullol has focused his research on the mechanisms of action of upper airway inflammation (rhinitis, rhinosinusitis) with special interest in neurogenic inflammation, regulation of glandular secretion and mucin production, united airway diseases, corticosteroid resistance, aspirin-exacerbated respiratory disease, the pathophysiology of the sense of smell, and more recently sinonasal stem cell biology. Joaquim Mullol is author and coauthor of more than 500 communications at Scientific Congresses and Meetings, and has published more than 180 pier-reviewed original articles, as well as a number of review papers and guidelines, in international scientific journals. He is currently the Rhinosinusitis Section Editor of Current Allergy and Asthma Reports and the Editor-in-Chief of Current Treatment Options in Allergy.